This feature is available only if you use Office 365. If you receive few mails every day then you don’t need this facility. All those who receive lots of mails are suffering from overloaded mailboxes and a large number of unhandled mails. With Office 365, we now get 50 GB mailboxes – which actually makes us lazier in managing our inbox effectively. Search is so good and comprehensive that it makes us additionally less active on the front of MANAGING the mailbox structure, folders, PSTs and so on. Everyone has used some technique to identify important mails using Rules, Sorting order, conditional formatting and other approaches. But all of these require human intervention. Now Microsoft is taking a different approach. They have added a very useful and powerful feature which works behind the scenes and attempts to remove less important mails from your inbox – so that you can focus on what is important. This new feature is called CLUTTER. Introduced on 11th November. Why am I writing an article about it in a hurry? Usually I do not cover latest trends and newly introduced features unless I test it and use it thoroughly and form my own informed opinion about it. However, CLUTTER is an exception. First of all, I want all of you to use it (if it is available to you) and more importantly, I want to provide guidance on how to manage it effectively. This guidance must be sought as soon as you enable the feature. Why? Because if you don’t know how to use it effectively, after a few weeks the work of managing it becomes exponentially more cumbersome. Hence this article. I will update it as I gain more experience and learn from others. This is available only for Office 365 customers who have Exchange Online subscription. This feature is being rolled out globally. So you need to check if it is available to you. This feature is NOT ACTIVE by default. Obviously, Microsoft does not want to dump a new thing on you without your consent. So you have to activate it. How to open Outlook web access? Go to Office 365 portal : http://portal.office.com and login using your username and password. Depending upon your configuration the portal page opens. Now click on the Outlook option in the top menu bar. In Outlook Web Access choose the Gear icon next to your photo. Choose Options. Now choose Clutter from the left pane. It is a very simple setting. Just switch it ON. But this simplicity hides immense amount of behind-the-scenes processing. What you just did is this. You told Outlook (rather Exchange) to monitor your handling of message and LEARN what seems to be important to you and what is not-so-important. It will then apply this “knowledge” and segregate messages to unclutter the mailbox. REMEMBER that you need OWA JUST TO ACTIVATE THE FEATURE. You need not USE OWA to handle mails. Go back to the mailbox and that there is a new folder created called – CLUTTER! The folder is named correctly because it will soon contain clutter. But now the system has started learning. So what do you do about it? To start with, NOTHING different. Handle the mails as you usually do. Let it observe and learn in the background. Slowly but surely – typically in 24 hours – it starts applying its learning to new incoming messages. If it thinks that the message is less important to you, it will automatically move it to clutter folder. YOU WILL NOT BE TOLD ABOUT IT. If you just enable Clutter and forget about it, you will be in trouble. Why? Because the system takes time to learn your usage patterns. Therefore, it is now your job to teach it the right pattern. Remember that your inbox is now Inbox + Clutter. So at the bare minimum you have to look at what is going into Clutter folder periodically. In the initial few days, do this at hourly interval – at least twice a day. Why? Because some messages which are IMPORTANT to you are bound to land into Clutter folder. The initial learning is not expected to be perfect. But you have to catch these mistakes early and provide a clear indication to clutter about the mistakes it makes. 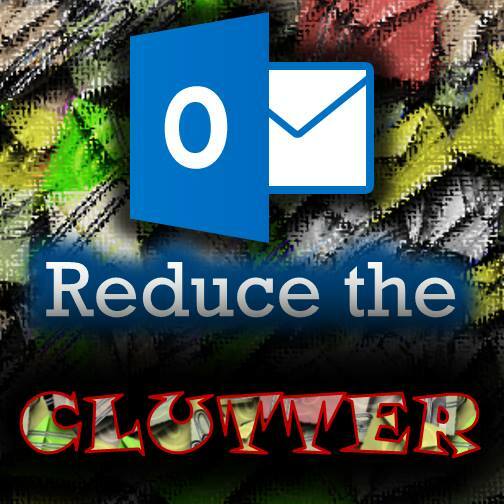 If an important message is seen in Clutter, just move it to Inbox – Drag Drop or Right Click and Move or use any other method available on your Outlook client. Moving a message to Inbox is a very clear and unambiguous hint to the learning system that it is NOT clutter. This is going to be your job for a few days – probably longer. I have been doing this every day for last 6 days. The reverse also works. Unimportant messages which landed in Inbox can be moved manually to Clutter. This accelerates the learning process. But this may be too much of workload for you so this part is optional. Although the folder is visible, it is important to actively NOTICE it. Therefore, right click on Inbox and add to favorites (if you have not done so already). Do the same thing to Clutter folder. If you have multiple mailboxes, arrange them in pairs in the Favorites. This way, you can monitor the numbers and also remember to scan the clutter folder often. This is REALLY important. On the desktop you will see the Clutter folder anyway. But most mobile devices sync only specific folders. Therefore by default, Clutter folder will not be synchronized. This is dangerous because you may be expecting a mail and you don’t see it in Inbox. But in reality it is happily lying in Clutter folder – which is not visible on the mobile…. You get the idea.. right? As soon as Clutter is activates check all mobile devices and sync the folder IMMEDIATELY. This is Clutter or This is NOT clutter. This option is available in Outlook web access. Right click on Inbox item has Mark as clutter option and inside clutter folder there is a Mark as not clutter option. Unfortunately, for this to work, you have to be using OWA as of now. Is this another flavor of junk mail? Don’t confuse the two. Clutter has nothing to do with Junk Mail. Junk mail is useless. You are not interested in it. It does not land in Inbox at all. Clutter is not JUNK. It is LESS IMPORTANT. Clutter is something where you looked at your Inbox on the mobile phone – you handled necessary stuff and ignored other messages. Those ignored ones belong to clutter. A message going into clutter may require attention or reply from you. But not immediately. In any case, depending upon your Auto Archive setting or Policies, unread older messages get archived. That is what is already happening in your Inbox. Now clutter made Inbox more relevant by moving such messages elsewhere. That’s all. Notifications, subscriptions to newsletters, word of the day kind of mails, receipts – these are the kind of things which will land in Clutter folder. All of us have created some rules for “Managing” the Inbox. Those will run as it is. No change there. Clutter does not interfere with what rules do. If a rule acted upon a message and moved it to another folder – it is not under Clutter domain anyway. But if a rule applied a category to a mail while keeping it in the Inbox, Clutter will look at it. It many not move it to Clutter folder. But it will process the mails which remain in Inbox and observe what you do about them. This is a user level feature. Assuming users discover it on their own and activate it – which is highly unlikely – but technically possible – they may post queries to IT helpdesk. Make sure the IT team knows about the feature is able to guide users. How to educate all users about this feature? As I said earlier, this small little radio button – available deep down under Options in OWA is unlikely to be DISCOVERED by users. But I feel it should be promoted proactively. The simplest way is to send this blog link to them. Of course there must be many other blogs and articles about it. I have tried to make this article USER friendly – minimal jargon and easy to assimilate. Use the images above in the mailer which you send internally. This is easy. Go to Outlook Web Access – Options and Turn it Off. Now the automatic processing will stop. But the Clutter folder created will still remain because it will have some messages in it. Even after disabling Clutter feature – these messages you need to handle manually. But I suggest that you don’t do this in a hurry. Give it some time before you decide that it is not useful to you. If you receive few mails, Clutter is not relevant. Don’t use it. It is a good feature. Lot of heavy duty artificial intelligence is trying to help you focus on important stuff and minimize wastage of your time in sifting through less important mails. So enable it. In the first few days / weeks (depending upon the volume), actively monitor what goes into Clutter folder and move important mails to Inbox. It may be required that you move such mails more than once to Inbox before clutter system understands your intent. Remember that Clutter learning happens once a day. So if you move a message to inbox right now and another message of similar type comes after one hour, it may still land in Clutter folder. Have patience. In the short run, you are the boss. But in the long run – Clutter system will become more and more relevant and accurate. Ask everyone in your team / organization to use it. Time saved is time gained. Let everyone benefit. While we are at it, look at all your existing rules and check if you really need them. This has nothing to do with Clutter feature but it is a good idea anyway. While making rules learn how to order them and use the Stop Processing More rules option effectively. “Oops! Sorry. I did not reply to your mail because it went to Clutter folder” is NOT a valid excuse. Beautiful video showing the concept. Brilliant and detailed article by Tony Redmond (WindowsITPro) about Clutter. There is another way to identify and color code important mails. Read this article to understand how: How to identify important mails automatically? Written on 2 Dec 2014. Clutter is working fine. I don’t check it very frequently because I know that it is filtering out the less important mails. Since a week, there is not a single mail that should have remained in Inbox but was diverted as clutter by mistake. I do look at the clutter folder once a day. I have learnt to move unwanted mails from Inbox to the Clutter folder and eventually the system manages to filter them automatically. In short – it works very well! Of course, individual experiences may differ but it is worth having more patience in training it rather than giving it up in a hurry. Then you will see the gear icon on top right side of the web page.